So, we survived the holidays, but the piggy banks and credits cards might not. Some took one too many on New Years eve. This month's theme is: The Day After........ but what day? Happy New Year to all!! Wishing everyone a very blessed and healthy and prosperous 2016!! To celebrate, count me in for two $5 gift cards for the HMs this month!! Thanks Sky, I will get Totte to add those, when he gets back from the birthday Party he is attending at the moment. Wow this is going to be a very interesting Month I can see that already with that title!!!! Hey, I knows wott I'm gonna be doin' afta' Chris'mas...Tryin' t' pays fer Chris'mas! Man, did it ever cost me out da wazoo! Family an' friends, dey's 'spencive, y'know? So, I comes up widda idea dat autta give me woirk fer at least a couple o' days anyways. Right before da holidays, I was wit' my bestest bud, Big Eddie Mac...yeah, I ain't even gonna ask ya...but he 'n' me wuz over to his Gran'ma's place helpin' t' cleans out her basement. Sheesh! Has dat ol' lady got a lotta junk down dere! We wuz diggin' 'round and way, back inna corner we uncovers dis ol' clock. Gran'ma Mac, she tells us, dat her Gran'fadda was kind of an inventor an' built dis thing back in 18...sumthin' an' it was a clock dat runs on steam! Now, havin' built dat steam powered Xmas tree back las' month, I knows all about steam and dat sorta stuff! So's I askes Gran'ma Mac if we kin takes it and trys t' gets it t' woik. She says t' us, se says, sure, she just wants it outta her basement. So's, me an' Big Eddie take dis t'ing over t' his place and starts t' woikin' on it t' gits it up and runnin'. So's it wuz about an hour or so later dat I notices da Li'l Eddie Mac...y'know, Big Eddie's li'l goil...ain't 'round no wheres. I notices it 'cause I hadda git up an' gets my own beer...an' Big Eddie tells me she's down t' da mall woikin'. Woikin' wott? I askes. Oh, he says, she's woikin' fer extra Xmas cash as one o' dem Santa's helper elves. Y'know, gittin' da li'l brats up and down offa poor ol' Santa's lap, handin' out candy canes and keepin' 'em in line. Y'know, elf stuff. Now, alla dat sorta gives me an idea. 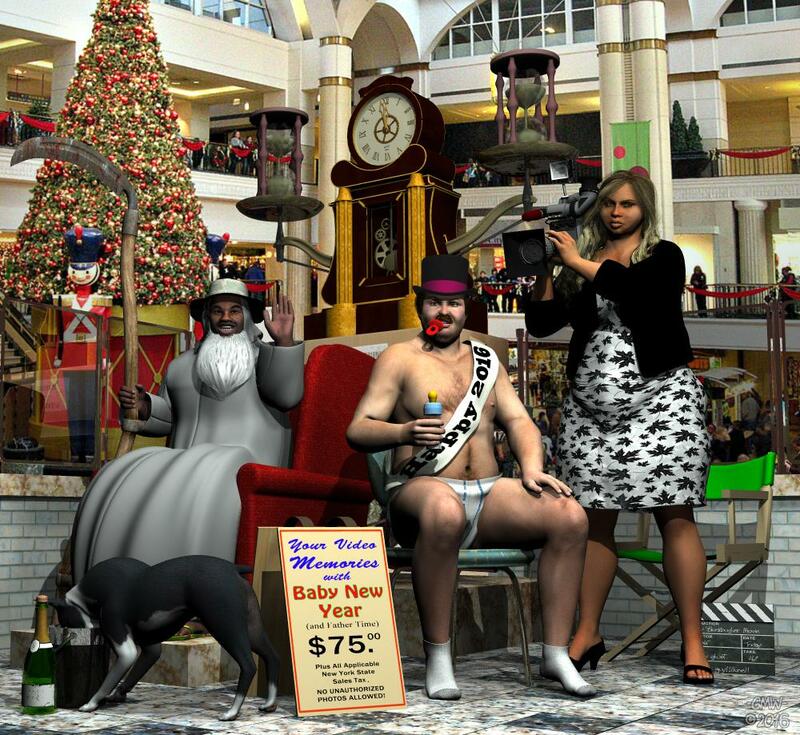 Y'always sees Santa at da mall, but how comes you never sees Fadda Time an' da New Year's Baby in da mall? You know, old year, new year sorta t'ing. Dat's when I thinks, yeah! We can do dis! 1.) New Year SteamPunk clock Registration Required. 3.) Wingback Chair Registration Required. 4.) Genesis Hooded Gown Registration Required. 5.) Hooded gown Morphs Registration Required. 6.) Merlin's Free Scythe Registration Required. 7.) Diaper for Genesis Registration Required. 8.) Top Hat smart prop for V4/A4 Registration Required. 9.) Ankle Socks for Genesis 1 (DS and Poser) Registration Required. 10.) K&K baby accesories Registration Required. 11.) G2F Jeanne Dress & Jacket Registration Required. 12.) Sandwich Board Prop 12th Item from Top. 14.) ...and, of course, dat %@#! mutt Boston! 4th Item from Top. As always, figure set-up in DAZ Studio 4.7 and final render in Bryce 7. Some Poser/DAZ Studio shader dependent elements were change to Bryce textures for effect. No postwork save for addition of signature and copyright information. Okay, I'm really, really late on this, but...I'd like to thank everyone for the well wishing regarding my recent medical problems (slowly improving at this point) and I'd also like to say thanks for awarding me 1st place for the November challenge. Yeah ...I cheated a bit here. I had done this for the December Challenge and decided that it just didn't fit the theme for the month. I held off posting it as a N.A.E. just in case I could use it for January. I still don't know if it fits the theme or not. I'll let the judges...uh, judge that. Anyway, I though that there were some pretty neat freebies that maybe some people hadn't seen. Happy 2016 everybody and have a safe and prosperous New Year! Hey, i'd be happy to match skywalkers offer if someone could tell me what an HM is? HM stands for Honorable Mention. Makes sense chohole, makes sense. Count me in, 2x 5$ gift cards for HMs. Best of luck people! Woo Hoo, thanks KindredArts! That's a total of 4 honorable mention awards folks! I see prize money flyin' everywhere and lots of chances to win... way better than the lottery if you ask me! LOL! LG, that is sooo wrong that almost seems right! Really nice use of the background mall scene. You might be giving some disturbed entrepreneurs out there some ideas! Now that gives me some inspiration!!!! I am off to make my The Day After render. Links checked, entry accepted, please transfer to the entries thread! Late Happy New Year btw, everyone! PS: Has everybody seen M4 Hero pack for free in the store?! I'm so happy! "The Day After" just that - imagination is the limit! I think you could do anything from the aftermath of a drunken party, to the aftermath of nuclear apocalypse. I'd say, just pick a significant day in the calender and compose a humorous or poignant imagining of the following day. 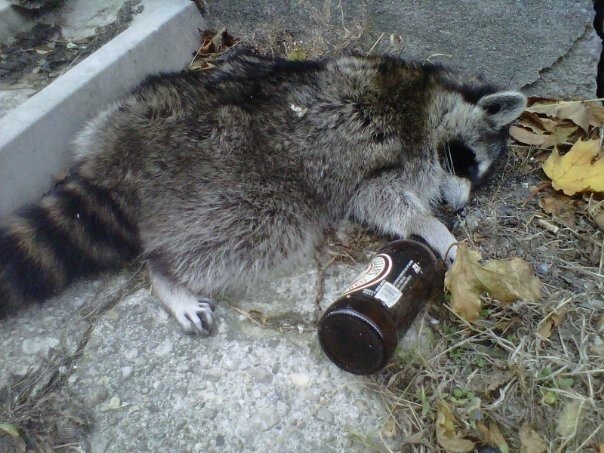 Save the Wildlife -- make sure you drink ALL the alcohol before throwing out the bottle. Mother Nature thanks you. I am still working on my render kinda stumped as what to use for the drinks bottles or cans can someone help plz??? I can cook you up something if you need something specific, That's still free right? Counts as free for the challenge if it is available for everyone to grab. You are right haha! I'm still trying! Just peeping in the see if there is any activity... everyone must be recovering from their "day after"! looks like you havn't seen a Panda before ... that's a Racoon.